Noel Fernando Salas. Played three seasons with Salti llo Saraperos of Mexican League... Had contract purchased by St. Louis Cardinals on Feb. 23, 2007. Participated in the 2008 All-Star Futures Game at the old Yankee Stadium and pitched a scoreless 7th inning for the World team in its 3-0 shutout victory over Team U.S.A. Pitched in Mexican Winter League with Mazatlan (2006-07) and Hermosillo (2009, 2013). Appeared in 61 games between the Mets and the Angels, going 2-2 with a 5.22 ERA...Began the season with the Mets and posted a 6.00 ERA in 48 games before his release on Aug. 15...signed with the Angels as a Minor League free agent on Aug. 19 and was 1-0 with a 2.63 ERA and a 0.66 WHIP...Allowed just 3 baserunners over his final 7 outings (0.47 WHIP). Acquired from the Angels on August 31 in exchange for minor league RHP Erik Manoah...Had a 2.48 ERA (nine earned runs/32.2 innings) with four saves in 34 games after the All-Star break...Held opponents to a .200 batting average during that span...Was 0-1 with a 2.08 ERA (four earned runs/17.1 innings) with the Mets...Stranded all five inherited runners with the Mets...Finished with a career-high 75 appearances...Also finished with a career-high 20 holds (seven with the Mets, 13 with the Angels)...Lost a career-high seven games (six with the Angels and five straight to end the year)...Righthanded batters went 32-141 (.227) and lefthanders were 31-131 (.237)...Allowed 10 hits in 55 at-bats with RISP (.182 batting average)...Retired 94 percent (16 of 17) of the first batters he faced with the Mets. Was on the roster for the NL Wild Card Game vs. San Francisco but did not pitch. Pitched in a career-high 72 games for Angels with a 5-2 record and 4.24 ERA (63.2 IP - 30 ER). His 72 appearances led all Angels pitchers, and his five victories matched career best, single-season total (also five wins in 2011 and 2014). Recorded 74 strikeouts and 12 walks, establishing career best averages of 1.7 walks per nine innings and 10.5 strikeouts per nine innings. The 1.7 BB/9 rate ranked sixth in the American League as a reliever (min. 60 IP) and the 10.5 SO/9 rate ranked 10th. His 6.17 strikeout to walk ratio is the best single season mark by a reliever (min. 60 IP) in Angels history, breaking the previous best rate of 5.94 by Bryan Harvey in 1991. Became first pitcher in Angels history to record three wins in a season in games when facing exactly one batter... On June 19 at Oakland, became first Angels pitcher to earn a win when throwing one pitch since Pep Harris on July 23, 1998 at Minnesota. Stranded 38 of 48 inherited runners... Ranked ninth in A.L. with 20.8% inherited runners scored percentage. In first season with Angels, posted a 5-0 record and 3.38 ERA (58.2 IP - 22 ER) in 57 big league appearances...Third pitcher in franchise history to win at least five games in a season without suffering a loss (Brendan Donnelly, 6-0 in 2006 & Pat Clements, 5-0 in 1985)...Made 13 appearances during month of Aug. and pitched 15 shutout innings allowing just four hits with no walks and 18 strikeouts...WHIP of 0.267 for the month is the lowest single month WHIP (min. 15 IP) in last 100 years in MLB...Registered two separate streaks of at least 10 consecutive scoreless appearances (10 G, Apr. 11 - May 4 & 13 G, Aug. 5-30)...Missed 19 games on disabled list with right shoulder inflammation from June 15-July 6...Allowed each of first nine inherited runners to score but did not allow any inherited runners to score after June 10...Pitched to a 2.65 ERA (37.1 IP - 10 ER) at home but had a 4.64 ERA (21.1 IP - 11 ER) on the road. Opened the season with Cardinals and posted an 0-3 record and 4.50 ERA (28 IP - 14 ER) in 27 games across three stints with St. Louis... Missed 33 games on the disabled list from May 21 - June 25... Went 1-2 with a 1.90 ERA (23.2 IP - 5 ER) and a team-high 12 saves in 22 appearances with Triple-A Memphis... Had eight appearances of four outs or more...Season high was 2.1 innings pitched which he reached twice in April... Recorded at least one strikeout in 18 of 27 appearances... Was not selected to Cardinals 2013 postseason roster... Traded to Angels along with infielder David Freese on November 22 in exchange for outfielders Peter Bourjos and Randal Grichuk. Appeared in 65 Major League games (69 including four minor league relief appearances),ranking fourth on the club. The 2011 team saves leader, opened season on MLB roster and made 18 appearances, before 5/26 option. Was recalled 6/7and remained rest of season. Was 0-3 with a 6.32 ERA before option and 1-1 with a 3.56 ERA following, including scoreless outings in 37 of 47 games. Finished 23 games,ranking second on the team behind Motte (58). Earned lone win of the season vs. LAD (7/25)throwing 2.0 scoreless innings with three strikeouts in a 12-inning 3-2 win.Was sharp in July, posting a 1-0 record with an 0.69 ERA in 13 appearances covering 13.0 innings with 14 strikeouts. Had nine appearances of four outs or more and was not scored upon in any. Topped out at 2.2 IP vs. ATL (5/12) and had six appearances of 2.0 scoreless innings. Went 15 scoreless appearances from 8/6 to 9/7, covering 12.2 innings with seven hits. Struck out 60 batters in 58.2 innings posting a 9.20 strikeouts/9 IP ratio. Ranked 28th in National League with a 28.1 Inherited Runners Scored percentage. 2012 POSTSEASON: Appeared in five post season games totaling 5.2 innings and allowed two runs for a 3.18 ERA...threw one scoreless inning of relief at WSH (10/11)in Game 3 of NLDS...appeared in four NLCS games with scoreless outings in Games 2, 6 & 7. Led the Cardinals with 24 saves, ranking 13th in NL and T13th in save pct. (80.0). 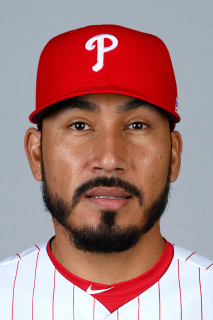 Became just the third native Mexican in MLB history to record 24 or more saves in a single-season, joining Joakim Soria and Juan Acevedo...Was recalled from Memphis (AAA) on 4/13, spending the remainder of the season with St. Louis. Had two saves in threegames (3.0 IP) for the Memphis Redbirds...Posted a 0.95 WHIP (walks+hits/IP), ranking 2nd in the National League among pitchers with at least 75.0 IP...Led the Cardinals with 24 saves ranking 13th in NL and T13th in save pct. (80.0)...Made his STL season debut on 4/14 at LA. Earned his first ML save 4/28 at HOU & his first ML win on 5/3 vs. FLA with 2.0 IP...His 2.28 ERA ranked 12th lowest among National League relievers, 2nd lowest on the club (Motte 2.25)...Held opposing batters to a .186 BA (50-269), ranking 10th lowest among National League relievers...Averaged a strikeout per inning (75 K/75.0 IP) in 68 appearances (he ranked 2nd on team in appearances)...Had six perfect inning saves on the season and four saves of more then 1.0 IP (all on the road)...In 34 appearances at home, went 5-3 with 9 SV and a 1.80 ERA; on the road was 0-3, 15 SV and a 2.70 ERA in 34 app...Pitched a career high 3.0 innings vs. WSH on 4/20 . Recorded saves in six-straight appearances from 5/19-31...Had 2.0 IP save 6/7 at HOU, the first save of 2.0 innings by a Cardinals pitcher since Joel Piñeiro (8/22/08). Threw a careerhigh 44 pitches in the game...Earned his 20th save on 8/4 at FLA, the 27th 20-save season in STL history.Garnered his 24th and final save on 9/16 at PHI, his first save since 8/30...2011 POSTSEASON: Made 11 postseason appearances, totaling 13.1 innings...the 11 app. ranked T5th among all playoff pitchersand the 13.1 IP ranked 4th among Cardinals pitchers and were the most among any reliever who did not make a start during theregular season...struck out 12 batters in the postseason, ranking T4th (w/Edwin Jackson) on the Cardinals staff...made fourappearances of 2.0 innings, posting scoreless marks in Game 2 of National League Divison Series and Game 4 of National LeagueChampionship Series...had three appearances of 34 pitches or more after having only six appearance of 30 or more pitches in theregular season...recorded four Holds in the postseason, ranking T2nd with teammate Arthur Rhodes and trailing Marc Rzepczynski(6) by two...threw a career-high 48 pitches in Game 6 of the World Series covering 2.0 IP, the second highest pitch total for a reliefpitcher behind Scott Feldman's 49 (TEX)...committed first error in Game 6 of the WS after not committing an error in any of his 289professional regular season games. Appeared in 27 games during his rookie campaign with St. Louis totaling 30.2 innings pitched...Began the year at Memphis (AAA) and was recalled to STL six times throughout the year...Made Major League debut 5/28 at CHI and threw a scoreless inning in a 7-1 win...Was perfect in his first three appearances, unscored upon in his first five...Blew his only save opportunity of season, allowing three runs to tie the game 9/18 vs. SD...Had eight appearances of five outs or more, six appearances of 2.0 IP...Held opposing batters to a .185 BA pre-All Star break and .258 post All-Star break...Posted a 1.93 ERA on the road (4 ER/18.2 IP) in 15 appearances...also had a 1.93 road ERA in Memphis in 18 app. (4 ER/18.2 IP)...Appeared in 34 games at Memphis with a 1-0 record and a 3.79 ERA, fanning 44 batters with just 9 walks...Was a perfect 19-for-19 in save opportunities in Memphis (AAA), ranking 3rd in the Pacific Coast League...Ran off 21 consecutive scoreless appearances from 5/3-7/17 in Memphis (21.2 IP, 8 H, 27 K)...Named PCL Pitcher of the Week (7/5-11). Appeared in 35 games despite injuries straining his right thumb (4/9-30) and a right shoulder strain (6/4-7/9)...Combined to go 4-2 with a 3.43 ERA and 32 K in 39.1 IP between Memphis (AAA), Springfield (AA) and Gulf Coast (R)...Began and finished the season at Memphis (AAA), making 24 appearances sporting a 3-2 record with a 3.67 ERA in 27 IP...Had one bad outing allowing four earned runs before injury (6/3). Without that game, ERA drops to 1.81...Finished the season with 10 consecutive scoreless appearances (11.2 IP, 6 H, 4 BB, 13 K), stranding all six inherited runners...Made 10 relief appearances from 7/10 to 8/2 in Springfield (AA), recording a win and seven scoreless outings...Appeared in one game in the Gulf Coast League tossing a scoreless inning in rehab appearance. Played with Double-A Springfield where he became theteam's closer in May and converted a league high 25 saves onthe year in a league-leading 60 games pitched...was one ofseven pitchers in all of minors to make 60 or more appearances(J. Motte had 63)...his 25 saves led the Texas League and 37games finished ranked 3rd...recorded 100 K's, which led hisSpringfield team and ranked 12th in the Texas League and hisSO/9 IP (12.16) led the League among relief pitchers. Walkedonly 16 in 74.0 IP...lefthanders hit just .226 (21-93) off Salaswhile righties hit .240 (44-183)...was the organization's MinorLeague pitcher of the Month for May when he had a 1.23 ERAin 14.2 IP, converting five saves and striking out 28 while walkingonly two...had two stretches of 9.2 scoreless innings pitchedfrom 4/17-5/1 and 5/5-24. Only allowed 1ER in between thosedates, on 5/3 a solo HR in 1.0 IP (1 ER/20.1 IP, 0.44 ERA)...wasselected for the All-Stars Futures game in New York during Julyand pitched a scoreless 7th inning for the World team during theWorld's 3-0 shutout over the U.S. team...was named to the TexasLeague post-season All-Star team. Named by Baseball Americaas one of the top-20 prospects in the Texas League...pitched inseven games for Venados de Mazatlan during the Mexican WinterLeague. Played May and June with St. Louis at High-A PalmBeach where he pitched 39.1 innings in 16 games...was loanedto Saraperos de Saltillo of the Mexican League where he playedin just three games...during the Winter League for Venados deMazatlan was 1-1 with 3 saves and a 2.95 ERA while he fanned14 vs. three walks. April 3, 2019 Acereros del Norte signed free agent RHP Fernando Salas. December 30, 2018 RHP Fernando Salas assigned to Naranjeros de Hermosillo. August 11, 2018 RHP Fernando Salas elected free agency. July 16, 2018 Atlanta Braves signed free agent RHP Fernando Salas to a minor league contract. July 16, 2018 RHP Fernando Salas assigned to Gwinnett Stripers. July 9, 2018 Arizona Diamondbacks released RHP Fernando Salas. July 6, 2018 Arizona Diamondbacks designated RHP Fernando Salas for assignment. March 24, 2018 Arizona Diamondbacks selected the contract of RHP Fernando Salas from Reno Aces. January 29, 2018 RHP Fernando Salas assigned to Reno Aces. January 20, 2018 Arizona Diamondbacks signed free agent RHP Fernando Salas to a minor league contract and invited him to spring training. December 21, 2017 RHP Fernando Salas assigned to Naranjeros de Hermosillo. November 2, 2017 RHP Fernando Salas elected free agency. August 31, 2017 Los Angeles Angels selected the contract of RHP Fernando Salas from Salt Lake Bees. August 19, 2017 Los Angeles Angels signed free agent RHP Fernando Salas to a minor league contract. August 19, 2017 RHP Fernando Salas assigned to Salt Lake Bees. August 15, 2017 New York Mets released RHP Fernando Salas. August 11, 2017 New York Mets designated RHP Fernando Salas for assignment. March 30, 2017 RHP Fernando Salas assigned to Las Vegas 51s. February 15, 2017 New York Mets signed free agent RHP Fernando Salas. November 3, 2016 RHP Fernando Salas elected free agency. August 31, 2016 Los Angeles Angels traded RHP Fernando Salas to New York Mets for RHP Erik Manoah. August 3, 2014 Los Angeles Angels recalled RHP Fernando Salas from Salt Lake Bees. July 26, 2014 Los Angeles Angels optioned RHP Fernando Salas to Salt Lake Bees. July 6, 2014 Fernando Salas roster status changed by Los Angeles Angels. July 4, 2014 Los Angeles Angels sent RHP Fernando Salas on a rehab assignment to Inland Empire 66ers. November 29, 2013 RHP Fernando Salas assigned to Naranjeros de Hermosillo. November 1, 2013 Fernando Salas roster status changed by St. Louis Cardinals. October 3, 2013 St. Louis Cardinals reassigned RHP Fernando Salas to the minor leagues. August 27, 2013 St. Louis Cardinals recalled RHP Fernando Salas from Memphis Redbirds. July 30, 2013 St. Louis Cardinals optioned Fernando Salas to Memphis Redbirds. July 19, 2013 St. Louis Cardinals recalled Fernando Salas from Memphis Redbirds. June 26, 2013 St. Louis Cardinals optioned Fernando Salas to Memphis Redbirds. June 19, 2013 St. Louis Cardinals sent RHP Fernando Salas on a rehab assignment to Memphis Redbirds. May 22, 2013 Fernando Salas roster status changed by St. Louis Cardinals. June 7, 2012 St. Louis Cardinals recalled Fernando Salas from Memphis Redbirds. May 26, 2012 St. Louis Cardinals optioned Fernando Salas to Memphis Redbirds. April 13, 2011 St. Louis Cardinals recalled Fernando Salas from Memphis Redbirds. March 28, 2011 St. Louis Cardinals optioned Fernando Salas to Memphis Redbirds. August 24, 2010 St. Louis Cardinals recalled Fernando Salas from Memphis Redbirds. August 15, 2010 St. Louis Cardinals optioned Fernando Salas to Memphis Redbirds. August 4, 2010 St. Louis Cardinals recalled Fernando Salas from Memphis Redbirds. July 28, 2010 St. Louis Cardinals optioned Fernando Salas to Memphis Redbirds. July 19, 2010 St. Louis Cardinals recalled Fernando Salas from Memphis Redbirds. July 2, 2010 St. Louis Cardinals optioned Fernando Salas to Memphis Redbirds. June 29, 2010 St. Louis Cardinals recalled Fernando Salas from Memphis Redbirds. June 25, 2010 St. Louis Cardinals optioned Fernando Salas to Memphis Redbirds. June 8, 2010 St. Louis Cardinals recalled Fernando Salas from Memphis Redbirds. May 29, 2010 St. Louis Cardinals optioned Fernando Salas to Memphis Redbirds. May 27, 2010 St. Louis Cardinals selected the contract of Fernando Salas from Memphis Redbirds. February 1, 2010 RHP Fernando Salas assigned to Mexico. January 26, 2010 St. Louis Cardinals invited non-roster RHP Fernando Salas to spring training. October 10, 2009 Naranjeros de Hermosillo signed RHP Fernando Salas. August 5, 2009 Fernando Salas assigned to Memphis Redbirds from Springfield Cardinals. July 9, 2009 Fernando Salas assigned to Springfield Cardinals from Memphis Redbirds. July 4, 2009 Memphis Redbirds sent RHP Fernando Salas on a rehab assignment to GCL Cardinals. June 18, 2009 Fernando Salas roster status changed by Memphis Redbirds. April 30, 2009 Memphis Redbirds activated RHP Fernando Salas from the 7-day disabled list. April 5, 2007 St. Louis Cardinals signed free agent RHP Fernando Salas to a minor league contract.